The Diplomat: Representatives of the nation of China. Ambassadors, emissaries, sometimes named “John Chinaman” or “John Confucius.” These figures are always male, dressed in formal native attire, have a symbolic parity to Uncle Sam and Columbia. Nast’s diplomat is wise, sometimes sarcastically so, above the fray, and usually dignified. Nast includes the diplomat as a foil to compare to American mob violence or unsavory behavior. Best examples: The Youngest Introducing the Oldest and Civilization of Blaine. Although historian John Kuo Wei Tchen has some concerns with many of Nast’s Chinese Americans, he concedes Nast’s efforts to defend the Chinese and calls the John Confucius character “unambiguously noble” (Tchen 203). The Victim: Often sharing characteristics of the Diplomat, Nast draws Chinese Americans alongside other beleaguered minorities of the era – Native Americans and African Americans. They are often shown in direct conflict with Irish Americans or mobs of people – usually white males, included to represent the working man. Chinese victims are often seen fleeing in terror, with their long braid or queue propelled in the air by the speed of their flight. Sometimes, as in “The Chinese Question,” the Chinese are defeated, deflated and dejected. As Americans: Nast includes Chinese, especially children, alongside other American children, particularly in his treatment of the public school controversy. Nast’s Uncle Sam’s Thanksgiving Dinner is his definitive statement on whether the Chinese belonged as part of the ‘American Story.’ Chinese women were extremely rare in the U.S. A few merchant wives were allowed to immigrate to the U.S. to be with their husbands, primarily on the West Coast. In New York, Chinese women were very rare.During the peak of Nast’s fame and concurrent with his anti-Exclusion cartoons, only 200 or so Chinese were reported to reside in New York City. Few nuclear Chinese families existed from which Nast could reference. This may account for why there is not a treatment of the Chinese similar to the “Emancipation of Negroes.” Nast creates a wife for the Chinese guest at Uncle Sam’s Thanksgiving table, a partner few Chinese men were permitted to have in the U.S. 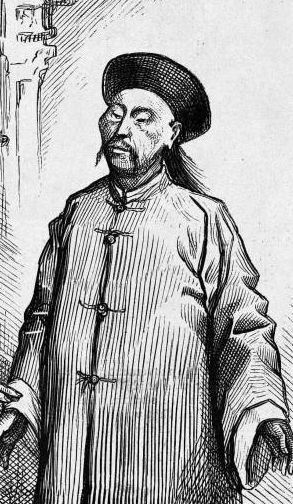 The Strange: Without extensive personal knowledge of the Chinese, Nast presented the Chinese as they were commonly viewed by others, either as a technique to grab attention, or as a direct result of his limited, if non-existent interactions with Chinese. Nast is not exempt in resorting to stereotype. In these cartoons, Nast exaggerates the eyes. At times, these Chinese are sinister and conniving. Sometimes they look like hyenas. Without a doubt, Nast plays upon, and perpetuates the Chinese as exotic or unusual. This may have been purposeful, in order to draw the viewer in. Nast frequently emphasized public attitude by using producing angry sentiment as posters and placards on a wall. The wording and declarations that appear in his cartoons (as opposed to captions) are not known to represent Nast’s personal view. In fact, there is no known record of how Nast personally felt about the Chinese. What is known is that he abhorred hate speech and hypocrisy, particularly if it was delivered by other immigrants, such as the Irish. The narratives of prejudice plastered on a wall or building often loom above and behind the victim, but always in plain sight for readers to consider. Nast often juxtaposes the victim against these narratives so that we may see the repercussions of these pronouncements. When we consider The Martyrdom of St. Crispin or The Latest Edition of Shoo Fly, it is legitimate to ask if Nast had crossed his own tolerant boundaries. Did Nast play up physical differences because he knew it would be received as funny or accepted? When studying these Nast compositions, we must look at the entire image to see if a larger message is being conveyed. For instance, Nast never drew the Chinese as “rat eaters.” But he does seem to echo common sentiment at times, playing on the exotic look of the Chinese. It is important to consider who else is joining Nast’s visual stage. Does his exaggeration of their physical features further a larger message? As unflattering to Chinese as some of Nast’s cartoons are, he often attacked their aggressors and anti-Chinese activists much more harshly. A question to ponder as we look at these images—was Nast really defending Chinese? Did he elevate them when he could? Did he endeavor to teach a greater higher moral lesson at the expense of the Chinese? Was Nast more focused on the hypocritical politician or the oppressor — the male, white labor figure (often Irish) and his behavior as an aggressor? The irony of one oppressed immigrant class demanding another immigrant ethnicity to leave the country did not escape Nast’s notice. It provided an irresistible irony for the artist to expose. In this sense, could it be that the Chinese figure is merely a convenient ingredient in a visual composition designed to attack Democrats, turncoat Republicans (Blaine) certain political figures, hypocrisy in general, or a favorite target, the Irish?